The fifth day of Tihar is Bhai Puja. “Bhai” mean brother in Nepali. This festival is mainly for brothers and sisters. It is believed that this tradition was started by Yama (the God of death) and his sister Yamuna because of their affection for each other. In this day, sisters apply sacred Tika on their brother’s forehead and pray to Lord Yama for her brother’s long life and prosperity. 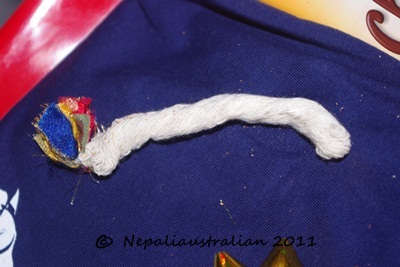 Some of the ethnic groups in Nepal use the Pancha Rangi Tika (Five coloured Tika) for Bhai Tika. First a base, rice flour is applied vertically on the forehead then yellow, green, red, blue and white colour Tika are put on top of this line in a row. But in the Newa culture, we just use rice, vermilion and yogurt, mix them and use that as a Tika. For this occasion, I had invited my brothers and their families to my apartment and we did the Bhai Tika on my balcony. This is how I did my Bhai Tika. Before the Bhai Tika, just like in Mha Puja, the floor was purified by sprinkling water on it, then we made Mandaps in front of a row of seats on the floor where my brothers were sitting. I used a copy of the same Mandap which was designed by AS but this time I printed them in A3 paper. 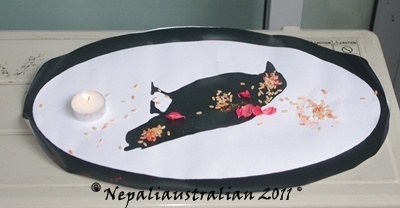 In Nepal the Mandaps are made by hand on the floor using oil, rice flour, vermilion, puffed rice and sometimes beans. The number of the Mandaps needed is three plus the number of people doing the Puja. So I had two big Mandaps, for my brothers. in a row and three smaller Mandaps at the top of the row for the House God (Kuladevata), Yamaraj and Janmaraj, and one crow drawn at the end of the row symbolising Lord Yama. 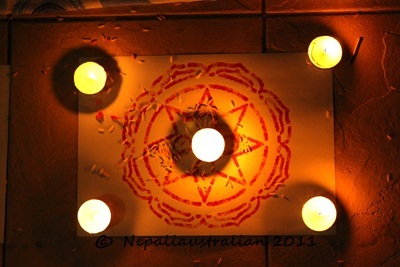 Beside the three Mandaps at one end, I also had a Sukunda with a candle on it. Then I put all the sweets and Rotis that I had made or bought as well as some fruits around the Mandap along with the Masala and Sagun. I also bought Soan Papdi. Then I had trays with fruits like mangoes, peaches, plums, rockmelons, oranges, apples and pears. I made Masala at home this year with dry coconuts, dry dates, raisins, almonds, pistachio nuts, apricots, dry figs, cashews, cloves, cardamoms, beetle nuts, hard shelled walnuts, palm sugar cubes and lots of Chocolates. I used clear cello wrap and colourful bows to make it look beautiful. 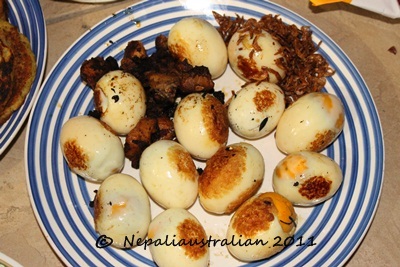 For Sagun, I boiled the eggs, took the shell out and fried them in a pan. I made Bara (lentil cakes, for which I will share recipe later), fried some chicken, fish and cut fresh garlic. I made Mala out of tinsel and bought Jajanka in a Nepali grocery store. Jajanka is made of many rounds of a white cotton thread forming a circle of about two feet in diameter and tied with a small piece of colourful cloth in order to have no ends. Jajanka symbolizes the integration of the beginning with the end. It is about creation, maintenance and fullness of life. Normally the Mala is supposed to be of Makhmali ful/Supadi ful (Globe Amaranth) as it never dries and always looks fresh. I also bought T-shirts for both of them. First I gave Nasala, a few drops of water, in the palm of the right hand of my brothers to throw some into the mouth and rest over the body for purification. I worshipped the House-God and Yama’s Mandap with water, rice, flowers, and vermilion powder. I gave water, rice, flowers, and vermilion powder to my brothers first to worship the Mandap of the House God and then the crow, then to worship their own Mandaps. The Mandap is used as a medium to present the various offerings to the self. Then I put Tika made of vermillion, rice and yogurt on my brothers forehead and gave them flowers to put on their head as a blessing form God. This was followed by Mala and Jajanka around their neck. 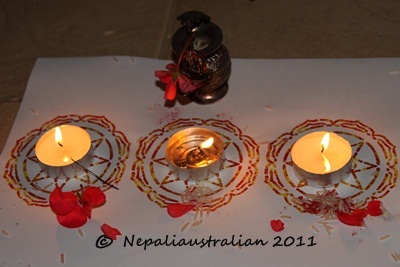 Normally in Nepal, they use Ita (special long threads made using white cloth soaked in mustard oil) but here we used tea light candles instead. I gave both my brothers the candles. They took the candle from my hand, lit them and put them on their Mandap. This light is believed to brighten the inner self and keep evil at bay. Then I took some water in an Ankhura (a small pitcher for Puja) filled with oil and water and Dubo in my hand and circled around my brothers three times. Then I gave them some rice and flower in their hand. Then I gave trays of Rotis, fruits, Masala, sweets and clothes to them and they had to hold them and keep them from touching the ground. Then I toke some rice and flower in my hand and showered each of them and worshipped the god within them. Only after that could they put the trays down. Then my brothers put Tika on my forehead, touched my feet for my blessings and gave me the gifts they had brought for me. Once everyone finished eating the Sagun, we used Kucho (broom) from top end of the row of Mandaps to the bottom of the row, touching each Mandpa to erase them and conclude our Bhai Tika. The third day of Tihar is Goru Puja, Govardhan Puja, Mha Puja and Nepal Sambat. Nepal is mostly an agricultural country so oxen are considered important animals as they help in ploughing the fields. That is why on this day they are worshiped with tika, garland and offered nice food. Also this day small hillocks made out of cow dung is worshiped. It is believed that once there was a drought in a village in Vridavan. The villagers were very worried and they wanted to perform a big Puja in honour of Lord Indra, the God of rain. But Lord Krishna convinced them that, they should not pray to Lord Indra since it was the Mount Govardhan that brought the rain and not Lord Indra. This made Lord Indra very angry and in his wrath he sent forth a big thunderstorm to flood the village. Lord Krishan lifted the Mount Govardhan as an umbrella above the village to protect the villagers and their cattle from the rain and flood. 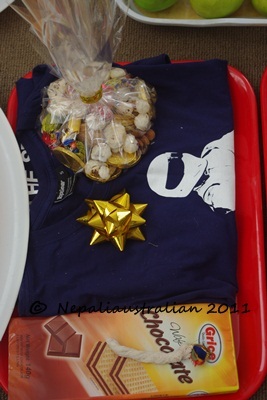 This is also the day Mha puja is performed by the Newa people. “Mha” means body in the Newa language so on this day the Newa people worship their inner self in the evening. They believe that the soul never dies and our body is only a vehicle and so we need to understand and respect our body as it is the chosen vehicle for this incarnation. This Puja is believed to bring prosperity and physical well-being. I performed Mha Puja with my brother , his family and with my cousins on my brother’s balcony. First the floor was purified by sprinkling water on it, then we made mandaps in front of a row of seats on the floor where we were sitting. Our mandap was designed by AS and I had printed them out in A4 paper but in Nepal they are made by hand on the floor using oil, rice flour, vermilion, puffed rice and sometimes beans. The number of the mandaps needed is three plus the number of people doing the puja. We need three smaller mandaps at the top of the row for the House God (Kuladevata) , Yamaraj and Janmaraj, one mandap for each of the member performing Mha Puja. Then at the end of the row, we had a crow drawn symbolising Yama the God of death. Normally the puja is done by the eldest member of the family but this year I did the process as my elder cousin is not in Sydney. First I gave Nasala, a few drops of water, in the palm of the right hand of everyone to throw some into the mouth and rest over the body for purification. I gave water, rice, flowers, and vermilion powder to each individual to worship their own mandaps. The mandap is used as a medium to present the various offerings to the self. Then I put tika on everyone’s forehead and gave them flower to put on their head. Normally in Nepal, they use Ita (special long threads made using white cloth soaked in mustard oil) but here we used tea light candle instead. I gave each person the candle and everyone took the candle from my hand, lighted them and put them on their mandap. This light is believed to brighten the inner self and keeps evil at bay. I used rice and flower in my hand to shower each individual and worshipped the god within. I gave Sagun to everyone. For Sagun , you put plate of egg , bara (lentil cake), meat,piece if ginger and fish in the right hand and yougurt in your left hand. Once everyone finished eating the sagun, we used kucho (broom) from top to bottom touching each mandap to conclude Mha puja. 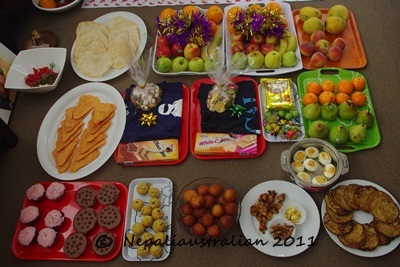 This day is also New years day for Newar community which is called Nepal Sambat . It is Nepal Sambat 1132 this year. Happy New Year!!! Also from this day, boys in groups go door to door singing special songs called Deusi similar to the Bhailo sung during Laxmi Puja. It is considered auspicious to have these groups come to your front door. The house owner will offer them some rotis, fruits and money and they sing Deusi songs blessing the household with good fortune. 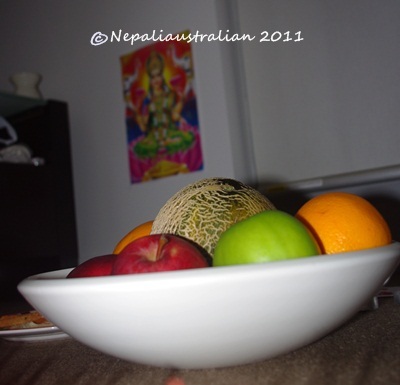 The third day of Tihar is Gai Puja and Laxmi Puja. In the morning of this day, the cow is worshiped. 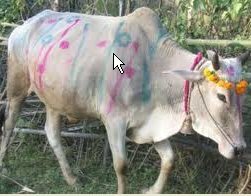 Hindus consider a cow as sacred and used its milk, dung and even urine for purification purpose. 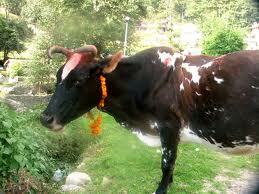 Cows are worshipped with tika and garland with a nice meal. People in villages who have a cow worship their cow but most of the people in Kathmandu don’t have a cow so they either go to a priest’s house or to a temple to worship the cow. 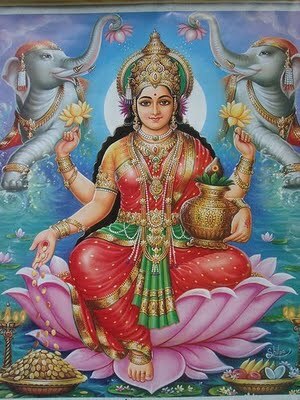 In the afternoon, the whole house is cleaned in preparation for welcoming the goddess of wealth, Laxmi. Most of the houses have their front door decorated with a mandap and have a trail of red mud leading to their Puja room(worship room in the house) . When I was young, I used to help mum do this. It was one of my favourite holiday activities. First red mud is used to make a trail leading to the Puja room. Once it is dry , a mixture of flour and water is used to make a symbolic footprint of Goddess Laxmi on the floor entering the home. Once the flour footprints have dried, vermillion mixed with oil is put on them along with some flowers. This results in a trail of small red footprints from the main door of the house to the Puja room symbolising that Goddess Laxmi has entered the house. 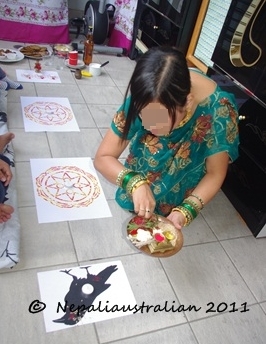 In Australia we can’t do this so I printed out small footsteps in a piece of paper and use that as an alternative to lead the Goddess Laxmi to our Puja area. We also put our piggy bank in the Puja area. Laxmi Puja is also done by businesses to have a prosperous year ahead. They put tika on Goddess Laxmi’s idol as well as their cash register and deposit safes. From this day on for the next 3 days, there will be women in groups coming door to door singing special songs called Bhailani. It is considered auspicious to have these groups come to your front door. The house owner will offer them some Rotis, fruits and money and they sing Bhailo blessing the household with good for fortune. The second day of Tihar is Kukur (dog) puja. A dog is man’s best friend and for Hindus, a dog is considered as the steed of God “Bhairab” as well as Yama’s (God of death’s) gate keeper. Dogs howling is consider bad as it means that, they saw “Yama “ coming to take someone away. Around the year, dogs help humans by guarding their house . 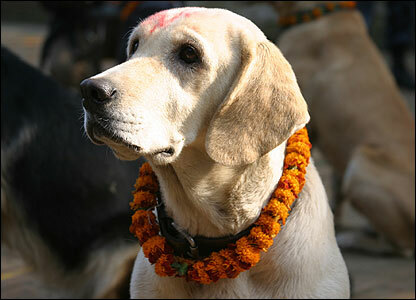 So on the second day of Tihar, dogs are worshipped by putting tika on their forehead and a garland around their neck. They are offered a delicious meal consisting of meat and other dishes. People perform the puja on their own dogs if they have dog at home, otherwise they perform the puja on stray dogs. 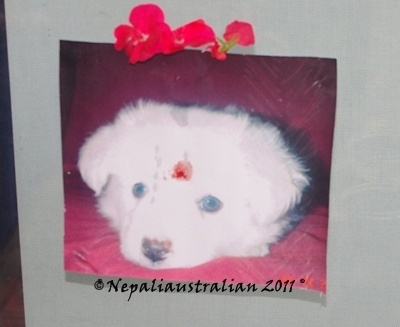 On this day you can see so many stray dogs have red tika and flower gland in Nepal. We don’t have a dog here but my parents have a dog called “Chootu”. 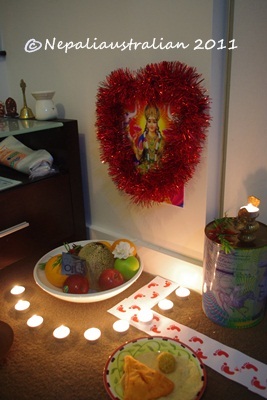 So I performed my Kukur Puja with his photo. I really am grateful to him that he is there to protect and warn my parents against thieves and the likes. 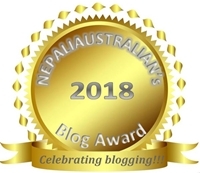 Thanks to my fellow blogger Basundhara (Nepal mero maya) for taking such an interest in my blog. I am writing Tihar posts with your comments in mind. Each day has different significance. This year Tihar is from 25 October to 28 October. Tihar is also called the festival of lights so houses in Nepal are decorated with lights and garlands of the marigold flowers. Normally houses are decorated either using traditional diyos (oil-fed lamps made with clay ), candles or electrical lights hangings from the roof in front of the house. During the night if you walk through the main roads of the city, it looks beautiful with the houses all around light up for the festival. 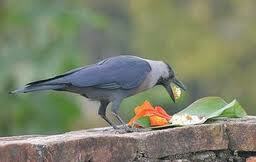 There are lots of stories/ mytological reasons behind the celebration of Tihar. One of them is that Lord Ram return to Ayodhya after 14 years of exile. He killed Ravan on Nawani of Dashain thus we celebrate Dashain and his home coming is celebrated in Tihar with lights and flowers. One of the thing I remember about Tihar is playing Langurburja. It is a game similar to the British dice game “Crown and Anchor”. I remember taking money from dad and running to play a game with my friends. The game is played with 6 dice and a mat. 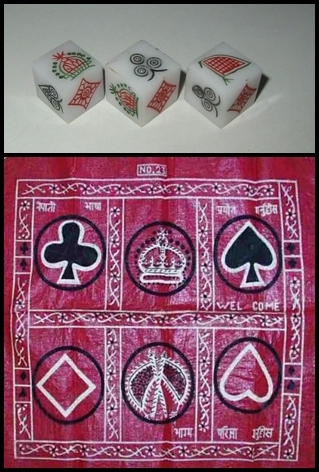 The mat has similar symbols, as the dice, and they are spades, hearts, diamonds, clubs, crown and flag. The player can choose one or more symbols to bet his money on. If he gets at least one die with the same symbol which he bet on, he wins. If he gets two then he wins 2:1, the more he gets on the throw the more money he wins. As a kid we used to play for 25 paisa (equivalent to less than a cent in AUD now) a game. It was more for fun than for the money. I am sure they now play with more money than that. Adults mostly play cards instead of Langurburja. 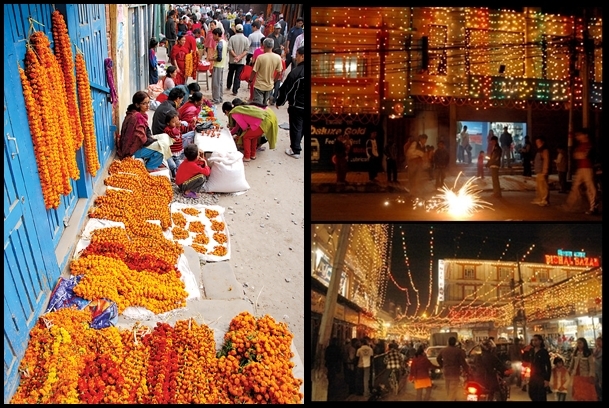 Tihar is celebrated a bit differently in various ethnic groups in Nepal. I will be writing my post based on the Newari culture. As the festival progresses, I will keep posting more on what I did and what each day is about. 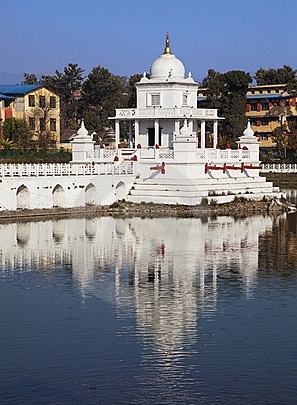 As you may already know Nepal follows a different calendar than the Gregorian calendar. 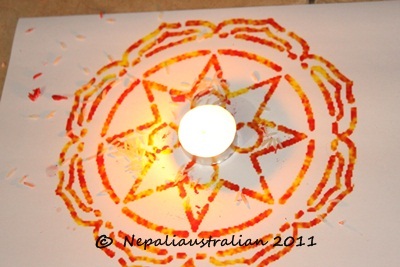 For most of the children born in Nepal, a birth chart is made by an astrologer as per the Hindu astrological calendar. This chart is called a “Cheena” or “Janam Patro”. So if you look at it as per the Gregorian calendar it looks as if a child’s birthday falls on a different date every year based on the Cheena. A day as per the astrological calendar is called a Tithi. So a child can have his birthday celebrated on his Tithi birthday or as per the Gregorian calendar or both. Every year, my mum takes my birth chart to an astrology to get my birthday according to the Tithi. And so every year, I have two birthdays. One according to the Cheena, and the other according to the Gregorian calendar. On my Tithi birthday , my mum performs some Puja in Nepal for me and on my Gregorian calendar birthday I usually have some friends over and enjoy the day. While Skyping last Saturday, she told me this year my Tithi birthday was last Tuesday. I thanked her for the gift she had sent me with my friend and told her how much I loved it. So Tuesday came as any normal day and I even forgot that it was meant to be my Tithi birthday for this year. We had invited some of my cousins and my brother for dinner(not for the birthday of course) that night so my head was occupied with all the cooking and planning I needed to do for the evening. I had to go for a training from work in the city that day so I didn’t reach home till 6pm. When I was rushing home to cook, AS called to let me know that he had to stay back at work a little longer (it always seems to happen when we have plans eeeerrrrrrrrrrr). I was annoyed but I knew he would have come early if he could to help me with the preparations. I went home and quickly started making dinner. While I was cooking, AS came home. 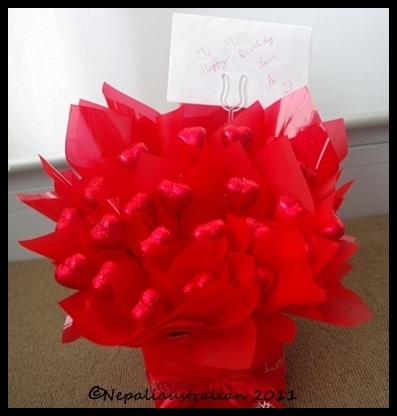 When he opened the door, I saw him carrying a stunning bouquet packed with luscious red chocolate hearts. It also had a card with very sweet message. “Light of my light, heart of my heart, you’re my true love under the stars. Happy Birthday Love”. He handed me the chocolate bouquet and wished me happy birthday. I was so touched and felt so special. I wasn’t expecting anything at all as I knew he would get me something on the day of my other birthday. I guess this is another perk of being married/in relationship. You get unexpected surprises which warms your heart .His gesture brought a big smile to my face and made me feel very loved. I love you baby. Thank you soooooooooooo much.